In its early days, Pixar turned out a number of short subjects, each of which helped them not only perfect their animation style, but also learn how to tell a good story. 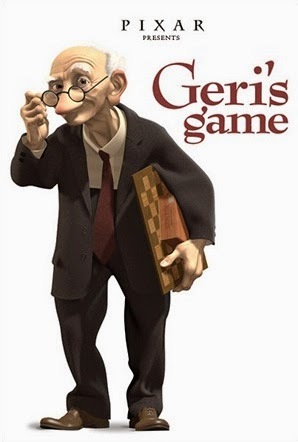 Even Now, the studio continues to produce short subjects, some of which play just before their feature films, and the one they showcased prior to 1998’s A Bug’s Life, an ingenious little gem titled Geri’s Game, remains my favorite of the bunch. It’s a beautiful autumn afternoon, and an elderly man named Geri (voiced by Bob Peterson) is in the park, preparing to play a game of chess. The only thing he's missing is an opponent, but that won’t be a problem for Geri because he’s perfectly happy manipulating both sides of the chess board. Moving from one side of the table to the other, Geri plays a rousing game, and in the end snatches victory from the jaws of defeat by making a very clever, yet highly illegal move. Geri’s Game marked the first time Pixar attempted a film, short or otherwise, that featured a human character, and the animation is superb. Geri’s movements at the start of the short are methodical; he walks, ever so slowly, from chair to chair, sometimes leaning on the table for support. To make it appear as if he’s two different people, Geri even removes his glasses after making the first move, then puts them on again whenever he’s back in that particular chair. Before long, the editing tightens up, and instead of watching Geri shuffle around the table, we see only his chess moves, giving the impression that he really is two different people. Story-wise, Geri’s Game is as simple as it gets. What makes it unique are the intricacies Pixar brings to the table (such as giving Geri two distinct personalities), taking the film to a whole new level. Movies like Toy Story and Monsters, Inc showed the world Pixar’s uncanny ability to weave a fascinating tale, and as Geri’s Game proves, the studio doesn’t need 90 minutes to do so. In fact, they can sometimes get the job done in less than five!